Recruitment professionals across five specialist sectors covering Sales marketing, customer services,business support, operations and technical,accountancy finance. Whether you are recruiting in one of these areas, looking for permanent employment or require temporary/contract work, our team of Customer Service specialists can help. Please contact your nearest office in confidence for a discreet conversation. Hey Buddy!, I found this information for you: "Plus One Personnel Ltd". 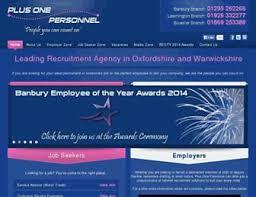 Here is the website link: https://oxfordlocals.com/ad/plusonepersonnel-recruitment-agency/. Thank you.